Onychoscopy is being increasingly used as a diagnostic modality for various nail diseases. Initial research had focused mainly on nail pigmentation and nailfold capillaroscopy; however, it is now being evaluated in various infectious and inflammatory nail disorders as well. The present review aims to summarize current knowledge about onychoscopic diagnostic criteria in nail diseases. The best level of evidence attached to each indication is mentioned to answer the pertinent question: How much can we rely on onychoscopy in confirming diagnosis of nail disease? There is a relative lack of diagnostic modalities which can be meaningfully used to diagnose nail disorders. Routine laboratory investigations such as potassium hydroxide examination and fungal cultures have low or variable positivity when used in the setting of nail disease as compared to skin disease. Radiological imaging modalities (X-ray, ultrasound, and magnetic resonance imaging) are known to have significant limitations when used to diagnose nail diseases other than tumors., Nail biopsy and diagnostic histopathology are not commonly used or routinely resorted to for nail diseases; various reasons being apprehensions in the mind of patients and clinicians alike. In addition, though we may consider histopathology as the diagnostic gold standard, our knowledge of diagnostic histopathological features and criteria in the setting of nail disease is far from complete. Onychoscopy (dermatoscopy of nail) has come of age. This is a diagnostic modality which is increasingly being used and evaluated by onychologists across the world. Its importance is partially due to the fact that an advent of various types of dermatoscopes has facilitated easier diagnostic use in nail diseases., Initial studies mostly focused on nail pigmentation; but as of now, onychoscopy has been evaluated in various nail diseases including infectious and inflammatory disorders., An additional use is nailfold capillaroscopy (NFC), used in the evaluation of systemic disease., The present review aims to summarize our current level of knowledge with respect to onychoscopic criteria of various nail diseases with an aim to understand if onychoscopy can replace nail biopsy in the coming future. For the purpose of this review, we conducted a PubMed search pertaining to articles published in the English language, using the keywords “onychoscopy”, “dermoscopy of nail”, “dermatoscopy of nail”, and “nail fold capillaroscopy”. The search yielded 12, 206, 220, and 107 indexed articles, respectively. Abstracts were studied and were classified into case reports, review articles and clinical studies of various types. 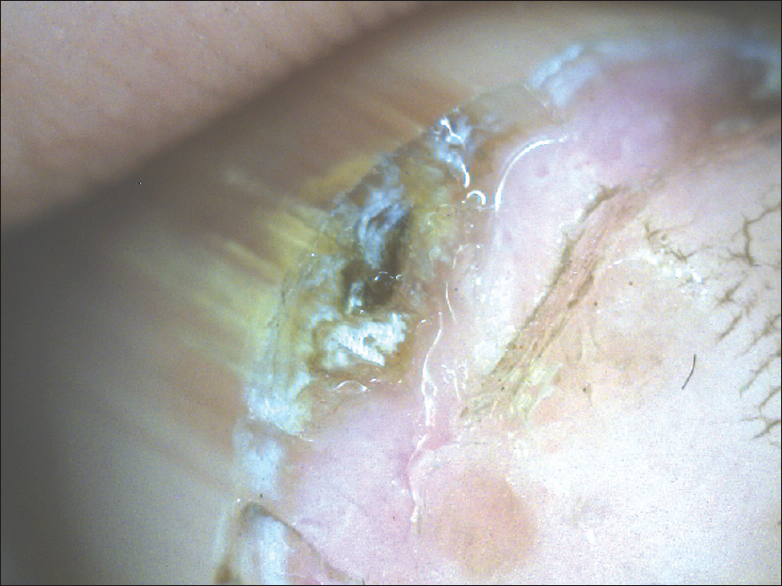 It was seen that the most commonly studied onychopathies were nail fold capillaroscopic abnormalities in connective tissue diseases, melanonychia, onychomycosis, and nail psoriasis. The full text versions of relevant articles (the ones offering the highest level of evidence) were downloaded and carefully evaluated. 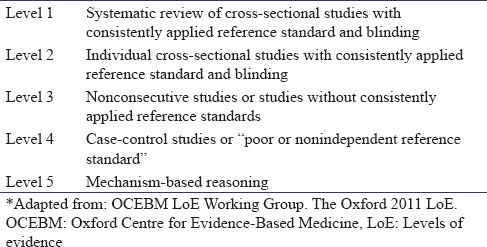 Based on this, relevant levels of evidence (LoE) were assigned to each study/report, based on the scheme proposed by Oxford Centre for Evidence-Based Medicine (OCEBM) in 2011 as outlined in [Table 1]. We attempted to assign the highest available LoE to the role of onychoscopy in an individual onychopathy. The proximal nailfold (PNF) is a unique location which has horizontally oriented capillaries. This fact is used for the evaluation of alterations in the microvascular architecture. Such alterations are known to be of diagnostic as well as prognostic significance. The use of onychoscopy thus offers a distinct advantage by helping us evaluate the PNF capillary architecture reliably at higher magnification. The conditions in which NFC has been found useful are summarized below. Abnormal NFC changes are now included in the revised diagnostic criteria for systemic sclerosis (SSc) (the ACR/EULAR criteria). The capillary abnormalities associated with system sclerosis are termed as the “scleroderma pattern” [Figure 1]a and [Figure 1]b. Three distinct NFC patterns have been described in SSc [Table 2]. NFC abnormalities in dermatomyositis have been defined by the presence of two or more capillary architectural changes in at least two nailfolds. The changes include capillary loop enlargement, capillary loss, disorganization of the normal distribution of capillaries, “bushy” capillaries, twisted enlarged capillaries, and capillary hemorrhages. Although architectural changes may be similar to those seen in SSc, the changes are less severe and less extensive in dermatomyositis. Dermatomyositis patients have less of avascular areas, and giant capillaries; additionally, mean capillary density is higher in these patients than in those with SSc. NFC findings in systemic lupus erythematosus are less sensitive and specific as compared to SSc. The various patterns of NFC defined in literature include morphologic changes in capillary loops and variability of capillary loop length. Mixed connective tissue disease is characterized by the presence of dystrophic, extremely convoluted, branched capillary, sometimes termed a pseudoglomerular or bushy capillary formations. Being a microangiopathy, diabetes mellitus has attracted the interest of researchers to study NFC changes associated with it. 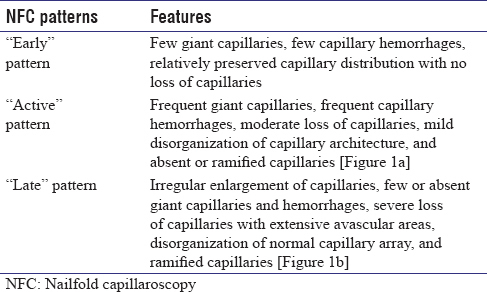 A significant number of patients have been shown to have changes in the capillary microvasculature as studied in the PNF  [Figure 2]. There was no evidence or consensus regarding which instrument or light is likely to be the most effective. Polarized and nonpolarized, as well as contact and noncontact dermatoscopes can be used. The group suggested the use of the same instrument during follow-up of the patients, preferably at a magnification of ×10. The best immersion fluid suggested was ultrasound gel. The group agreed that dermoscopy is useful in distinguishing the presence of blood versus melanin, on the basis of the following features which constitute a step-wise algorithm, to be followed while evaluating pigment in the nail unit. This is suggested by a pattern of globules, with or without distal streaks. It could be composed of a range of colors varying from red to brown to black [Figure 3]. However, it was emphasized that a dermoscopic diagnosis of subungual hematoma does not rule out a coexisting nail tumor, especially melanoma. The group suggested that this can be due to either melanocyte activation or melanocyte proliferation. Benign melanonychia due to melanocyte activation (ethnic or drug induced) is suggested by a homogenous gray coloration with thin, longitudinal gray lines [Figure 4]. The color can however vary depending on the pigment location and nail plate thickness. A brown background, associated with regular parallel lines of identical color, spacing and width, suggests a benign lesion (a nevus or a lentigo) [Figure 5]. At the same time, it was reported that this regular pattern may not be observed in some cases, especially in children, and rarely even in adults. A brown background with longitudinal lines that are irregular in color, width, spacing, and parallelism is suggestive of malignant melanoma. The important point is the homogeneity of color and width of each individual longitudinal line. Individual lines showing irregularity in color or width along their length raises the suspicion of a melanoma. At the same time, melanoma in adults may often show a diffuse dark background with barely visible lines. The group agreed that a dark background with areas of different hues of pigmentation is suggestive of a melanoma even in the absence of irregular lines. 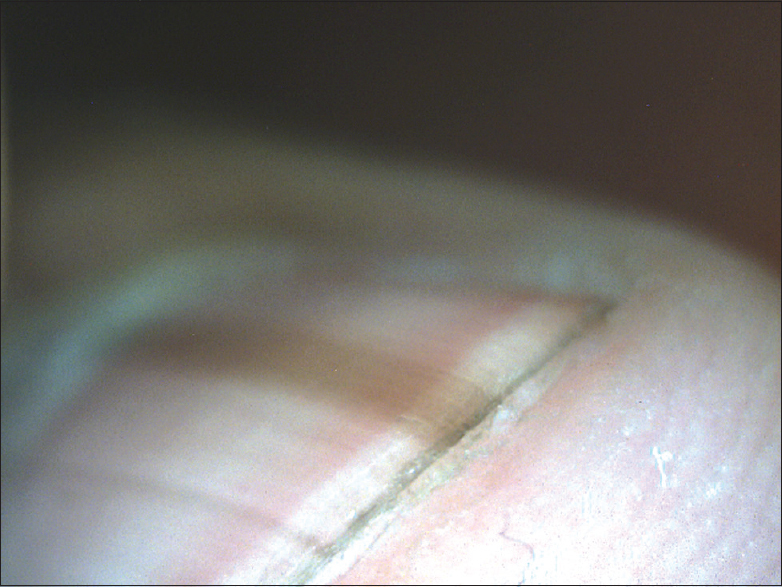 Dermoscopy of the distal edge can give a clue regarding the probable origin of pigmentation within the matrix. 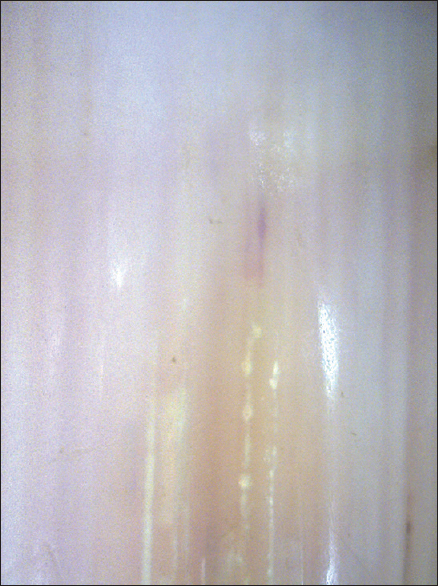 A pigmented band presenting on the dorsal part of the nail plate probably originates from the proximal nail matrix, [Figure 6] whereas a band presenting on the ventral aspect originates from distal matrix. The group agreed that this may not be a reliable marker, especially when the nail plate is thin or has very dark or very light pigment bands. Dermoscopic examination of the PNF and hyponychium allows one to distinguish between benign nevi and nail melanoma (Hutchinson's or micro-Hutchinson's sign). In the end, the study group summarized that as of now, any decision regarding the need for excision should be based on established clinical criteria and not solely on dermoscopic criteria. 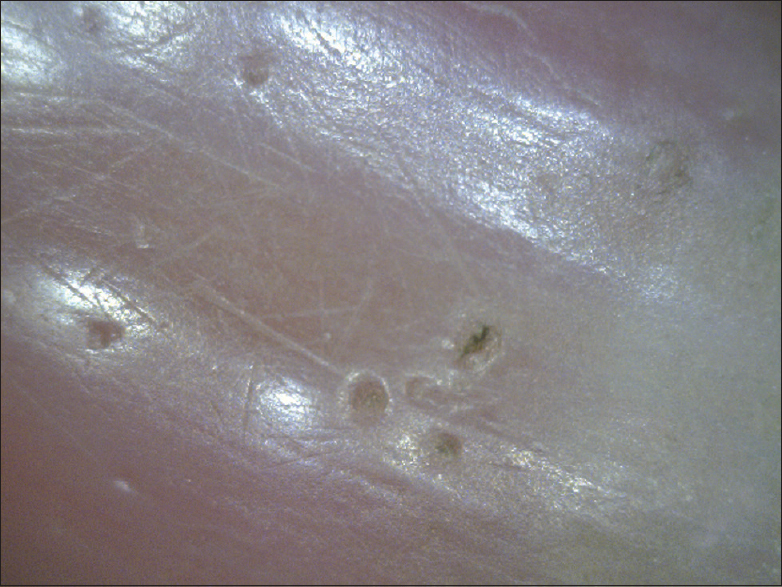 Ruin pattern: indented areas are seen on the ventral nail (subungual keratosis), and there is distal pulverization characterized by thickening of the nail plate. This pattern is best seen in TDO [Figure 9]. There is a lack of comparative studies in this field using other dermatoses as controls. Nevertheless, these features have been corroborated by most of the published work in this field. Correlation with histopathologic evidence is also lacking. Other reported onychoscopic features of onychomycosis include fungal melanonychia, seen as black-to-brown longitudinal/transverse bands. It can be differentiated from other causes of melanonychia due to its homogenous pigmentation and/or coarse granules or pigmented clumps with the pigmented lines. These granules and clumps correspond to the fungal colonies. It is also reported that the bands here are wider distally and narrow proximally. Dermatophytoma appears as round-shaped yellow-to-orange color patches in the nail plate connected by a narrow channel to the distal nail plate. Recently,” White streaks” has been proposed as a useful dermoscopic sign to differentiate DLSO from nail psoriasis. Other newly described onychoscopic feature is “distal irregular termination” which correspond to distal pulverization characteristic of thickening of nail plate in TDO. Onychoscopy has also been utilized as a tool to locate the best proximal site for mycological sampling. Onychoscopic features in psoriasis depend on whether the nail matrix and/or nail bed is involved with psoriasis. Onychoscopy permits a better visualization of features not visible to naked eye. This is in addition to valuable diagnostic information about the disease gleaned from the vascular structures visualized in the PNF and hyponychium. 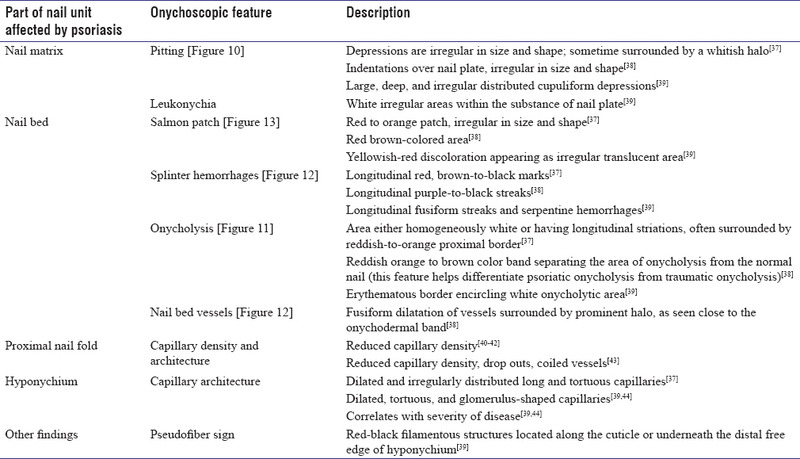 The salient onychoscopic features of nail psoriasis are summarized in [Table 3]. There have been a fair number of studies reporting the frequency of different onychoscopic changes in nails affected by psoriasis. In a study involving 68 patients, Yadav et al. reported nail pitting [Figure 10] to be the most common finding, followed by onycholysis [Figure 11]. Psoriatic onycholysis is bordered by a distinct erythema and the edge of onycholysis is relatively straight and not jagged. On the other hand, a recent study of 67 patients reported splinter hemorrhages [Figure 12] to be the most common finding followed by pitting and onycholysis. Onychoscopy also helps identify and delineate salmon patch better than naked eyes., [Figure 13]. The presence of onycholysis as a sole feature of nail disease is a fairly common scenario. In such cases, it becomes difficult to diagnose the etiology, if no other cutaneous clues are present. Onychoscopy is a valuable investigation in this scenario as it helps differentiate between the three most common causes of onycholysis [Figure 7] and, [Figure 11] and [Figure 14] as summarized in [Table 4]. 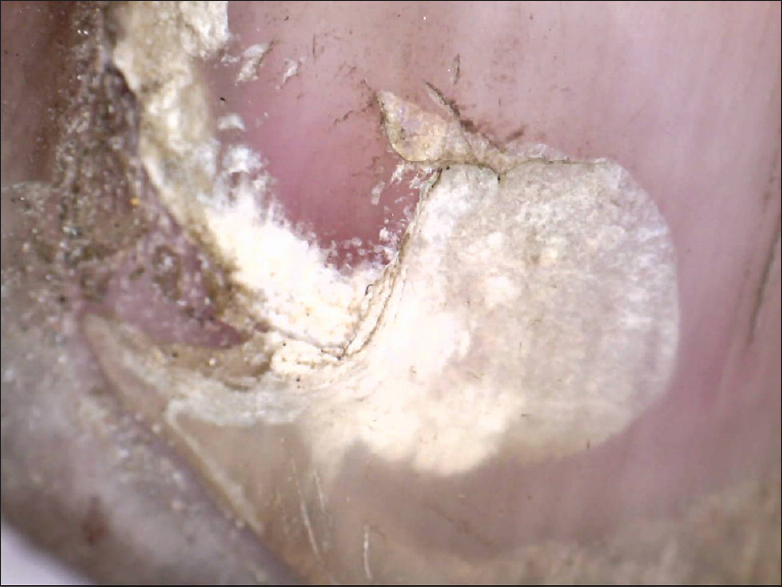 Not much work has been done on onychoscopy of nail lichen planus. The onychoscopic characteristics have been described in only 3 studies till now,,, and there have been no attempts to correlate them with clinical features or with histopathology. Even these limited studies have not followed a case–control format, neither have they studied large numbers of nails. Nail involvement is seen in around 10% of cases of lichen planus. Because of its aggressive behavior, early diagnosis and management becomes necessary. Nakamura et al. described onychoscopic features in 11 patients with 79 affected nails and divided them into nail matrix and nail bed changes. 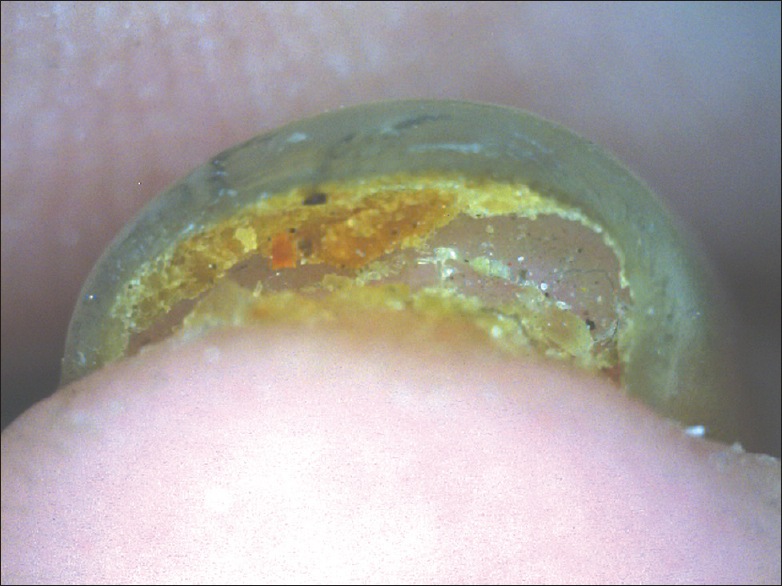 Nail matrix changes included trachyonychia (40.5%) [Figure 15], pitting (34.2%) [Figure 16], pterygium (21.5%) and red lunula (3.8%); while nail bed changes included chromonychia (55.7%) [Figure 17], nail fragmentation (50.6%), splinter hemorrhages (35.4%), onycholysis (27.8%) and subungual keratosis (7.5%). Other features reported included paronychia (31.6%), longitudinal streaks and anonychia. They attempted to identify poor prognostic factors in the form of nail bed features and converging longitudinal streaks which they associated with a poor treatment response. No capillaroscopic changes were observed. Another study by Friedman et al. reported chromonychia, subungual hyperkeratosis, and onycholysis and nail plate destruction as being the onychoscopic features of nail lichen planus. Onychoscopy has been used for the evaluation of many tumors. However, the evidence available is only in the form of reports of a single case or a small series. The published reports are summarized below. Onychomatricoma is a benign fibroepithelial tumor specific to the nail apparatus. The classical tetrad includes xanthonychia, ungual hyperkeratosis, splinter hemorrhages, and transverse plus longitudinal overcurvature of nail plate. The onychoscopic features of 34 cases have been described in a study by Lesort et al. They detailed the features in the form of longitudinal parallel white bands (81.8%), parallel lateral edges (96.9%), splinter hemorrhages (81.8%), dark dots (84.8%), nail pitting (93.9%) and thickening of the free edge (93.9%). Dermoscopic features were found to have less inter observer variability as compared to the clinical features. Onychopapilloma is a benign tumor of the nail bed and distal matrix. It presents as longitudinal erythronychia, leukonychia or melanonychia, associated with splinter hemorrhages, and characteristic subungual keratotic mass with distal fissuring. Onychoscopic appearance has been described as a band appearing to originate from the lunula with a proximal convex border and few splinter hemorrhages within. Tosti et al. reviewed 47 cases onychoscopically, reporting red bands originating from the lunula along with splinter hemorrhages. Another characteristic dermoscopic feature of the distal edge is a keratotic subungual mass corresponding to streaks, seen in all the cases [Figure 18] and [Figure 19]. Glomus tumor is an uncommon benign vascular hamartoma arising from the modified smooth muscle cells of the glomus body. Although histopathology remains the gold standard investigation for confirming the diagnosis, typical onychoscopic features have been described. 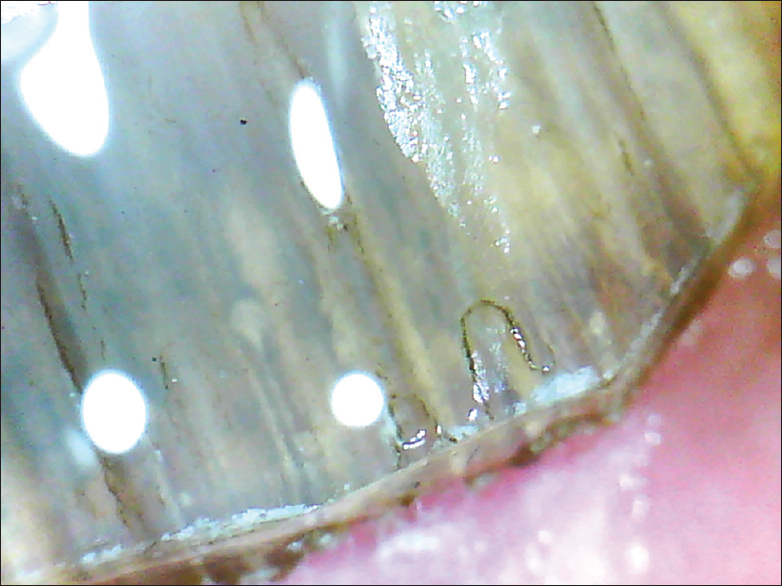 Onychoscopy of nail plate reveals discrete linear vascular structures. Even more characteristic is the intraoperative appearance (after nail plate removal). It shows the presence of ramified telangiectasiae over blue background at the site of tumor. Tumor margin can be considered corresponding to the abrupt loss of telangiectasiae at the periphery of the mass. Duarte et al. reported an irregular bluish patch with irregular linear vessels on onychoscopy. This can aid in localizing the tumor and delineating the surgical margins. Another study reported the appearance of homogeneous white area of the nail plate and disappearance of the lunula. Onychoschizia was seen involving the distal nail plate. Thatte et al. did UV light dermoscopy of glomus tumor which revealed a “pink glow,” which the authors suggested was because of the vascular nature of the tumor. A pyogenic granuloma in the periungual location may present as a diagnostic dilemma. Onychoscopic features described include a reddish homogenous area with white rail lines. A distinct advantage offered by onychoscopy is in the recognition of warts in early stages of their evolution. This comes particularly handy in the periungual location where other differentials need to be ruled out. 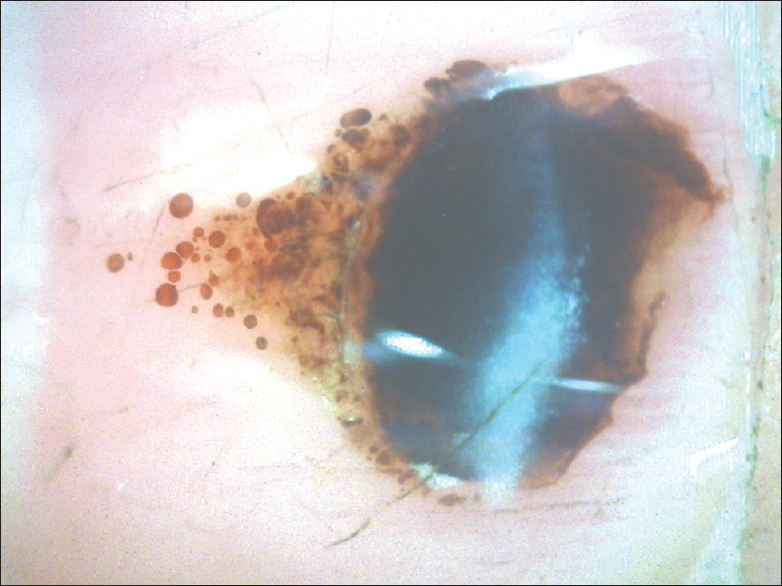 Multiple red-black dots corresponding to thrombosed vessels in the keratotic lesions are seen on onychoscopy, helping to differentiate from other tumors arising subungually [Figure 20]. This is again a difficult to diagnose disorder when arising in the periungual location. Onychoscopic features include islands of whitish scale and numerous, diffusely distributed red dotted vessels. The vessels have whitish halo and occur on a whitish-pink background. Nakayama et al. described the presence of these dotted vessels in 1 out of 3 patients with pigmented periungual Bowen's disease. As compared to other body sites, there is a relative absence of glomerular/dotted vessels in the periungual location. 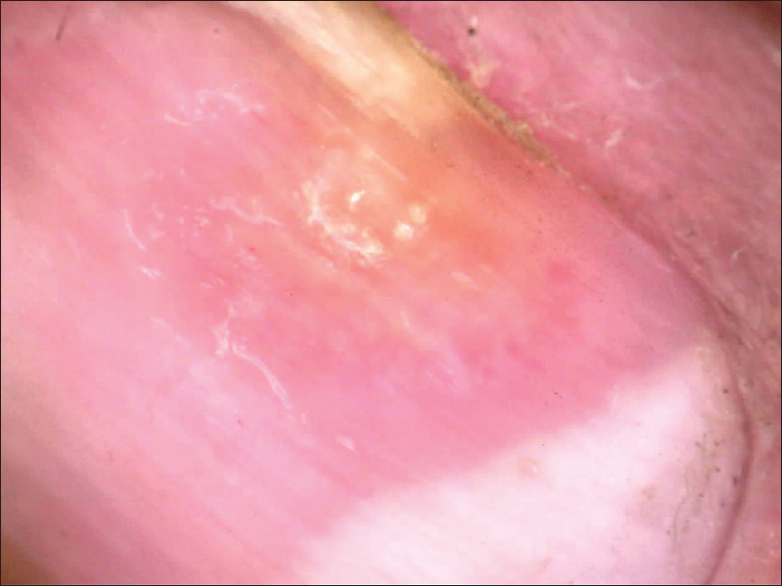 This can be explained by the presence of a thick stratum corneum which obscures the visibility of vessels in the papillary dermis. Although Hutchinson's sign is considered a useful marker of periungual melanoma, it has also been reported with periungual Bowen's disease. In this setting, it is known as pseudo-Hutchinson's sign. This was reported in 1 out of 3 patients studied by Nakayama et al. The essential differences are summarized in [Table 5]. This is another relatively uncommon tumor arising mostly from underneath the PNF. Onychoscopy shows the presence of clumps of homogenous red lacunae divided by a white meshwork-like septal wall. 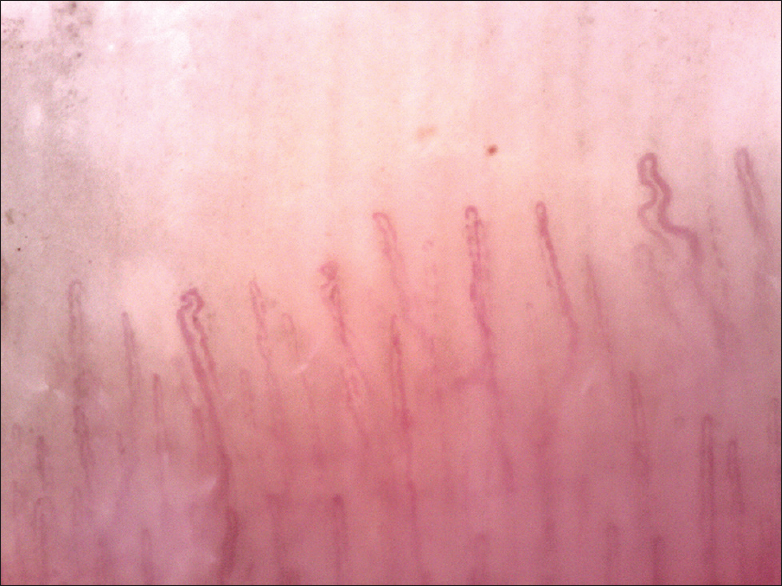 Telangiectasiae can be observed over the adjacent skin. Leukonychia can be of diverse origins and multiple patterns. A transverse leukonychia of the toenails commonly results from repeated trauma to the distal nail plate from the shoes while walking. 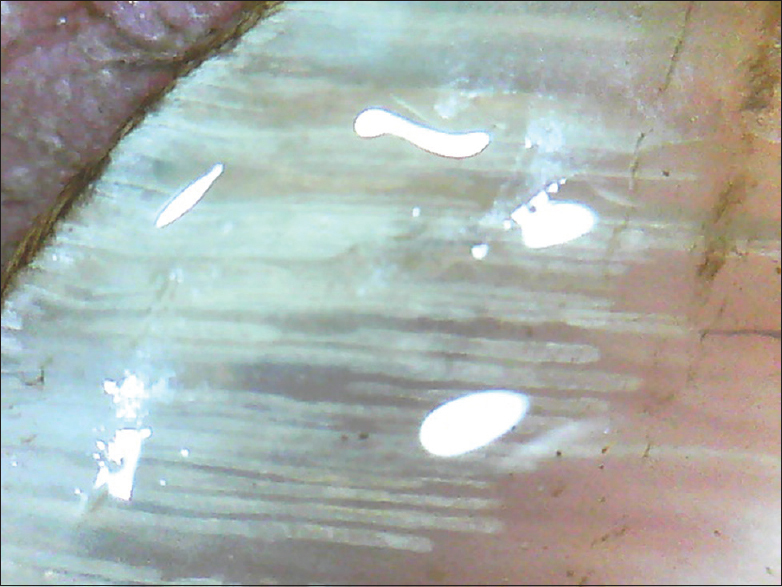 On onychoscopy, it shows one or more white transverse bands in the deep plate with a normal smooth nail plate surface. Bel et al. have reported the presence of longitudinal white streaks with variable thickness, originating from lunula in Hailey–Hailey disease. This is an important early sign of the disease. Onychoscopy is a noninvasive and easily reproducible technique which has long been utilized in the study of nail pigmentation and NFC. It has produced consistent results in these conditions and has stood the test of time. Its application, however, in other onychopathies is still in developmental stages. The preliminary results are promising and controlled studies with larger sample size and higher power are needed to build up the evidence. Whether it can replace nail biopsy as a standard diagnostic tool or not, remains to be seen. Nevertheless, onychoscopy has carved out a niche for itself in the current diagnostic scenario. Shenoy MM, Teerthanath S, Karnaker VK, Girisha BS, Krishna Prasad MS, Pinto J. Comparison of potassium hydroxide mount and mycological culture with histopathologic examination using periodic acid-Schiff staining of the nail clippings in the diagnosis of onychomycosis. Indian J Dermatol Venereol Leprol 2008;74:226-9. Thomas L, Vaudaine M, Wortsman X, Jemec GB, Drape J. Imaging the Nail Unit. In: Eds Baran R, de Berker DA, Holzberg M, Thomas L, editors. Baran & Dawberbe Diseases of the Nails and their Management. 4th ed. Wiley-Blackwell; 2012.p. 101-82. Grover C, Khurana A, Jain R, Rathi V. Transungual surgical excision of Subungual Glomus tumour. J Cutan Aesthet Surg 2013;6:196-203. Grover C, Chaturvedi UK, Reddy BS. Role of nail biopsy as a diagnostic tool. Indian J Dermatol Venereol Leprol 2012;78:290-8. Grover C, Jakhar D. Onychoscopy: A practical guide. Indian J Dermatol Venereol Leprol 2017;83:536-49. Lencastre A, Lamas A, SA D, Tosti A. Onychoscopy. Clin Dermatol 2013;31:587-93. Ronger S, Touzet S, Ligeron C, Balme B, Viallard AM, Barrut D, et al. Dermoscopic examination of nail pigmentation. Arch Dermatol 2002;138:1327-33. Nakamura RC, Costa MC. Dermatoscopic findings in the most frequent onychopathies: Descriptive analysis of 500 cases. Int J Dermatol 2012;51:483-5. Mannarino E, Pasqualini L, Fedeli F, Scricciolo V, Innocente S. Nailfold capillaroscoy in the screening and diagnosis of Raynaud's phenomenon. Angiology 1994;45:37-42. Blockmans D, Beyens G, Verhaeghe R. Predictive value of nailfold capillaroscopy in the diagnosis of connective tissue diseases. Clin Rheumatol 1996;15:148-53. Accessed from: http://www.cebm.net/wp-content/uploads/2014/06/CEBM-Levels-of-Evidence-2.1.pdf. [Last accessed on 2017 Oct 22]. Van den Hoogen F, Khanna D, Fransen J, Johnson SR, Baron M, Tyndall A, et al. 2013 classification criteria for systemic sclerosis: An American College of Rheumatology/European League against Rheumatism collaborative initiative. Arthritis Rheum 2013;65:2737-47. Cutolo M, Sulli A, Pizzorni C, Accardo S. Nailfold videocapillaroscopy assessment of microvascular damage in systemic sclerosis. J Rheumatol 2000;27:155-60. Klyscz T, Bogenschnsc O, JO, Js M, Rassner G. Microangiopathic changes and functional disorders of nail fold capillaries in dermatomyositis. Hautarzt 1996;47:289-93. Candela M, Pansoni A, De Carolis ST, Pomponio G, Corvetta A, Gabrielli A, et al. Nailfold capillary microscopy in patients with antiphospholipid syndrome. Recenti Prog Med 1998;89:444-9. Granier F, Vayssairat M, Priollet P, Housset E. Nailfold capillary microscopy in mixed connective tissue disease. Comparison with systemic sclerosis and systemic lupus erythematosus. Arthritis Rheum 1986;29:189-95. Maldonado G, Guerrero R, Paredes C, Res C, RNailfold capillaroscopy in diabetes mellitus. Microvasc Res 2017;112:41-46. Di Chiacchio ND, Farias DC, Piraccini BM, Hirata SH, Richert B, Zaiac M, et al. Consensus on melanonychia nail plate dermoscopy. An Bras Dermatol 2013;88:309-13. Haas N, Henz BM. 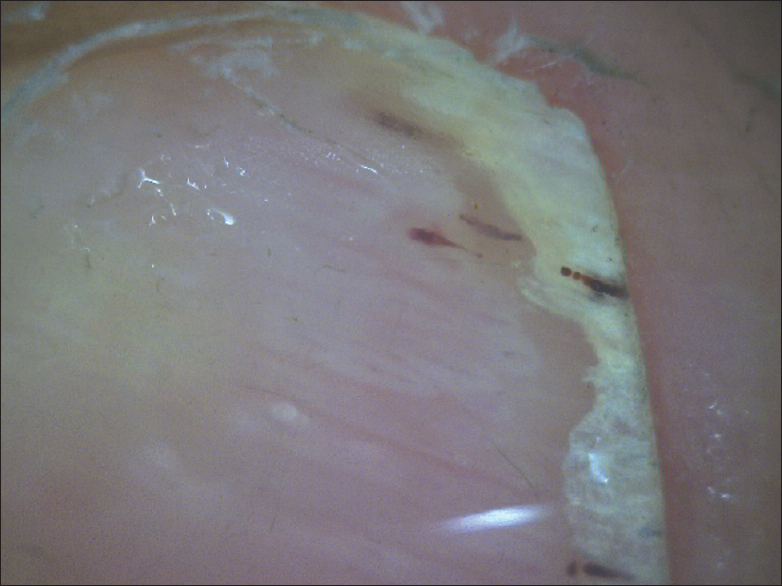 Pitfall in pigmentation: Pseudopods in the nail plate. Dermatol Surg 2002;28:966-7. Gencoglan G, Gerceker-Turk B, Kilinc-Karaarslan I, Akalin T, Ozdemir F. Dermoscopic findings in Laugier-Hunziker syndrome. Arch Dermatol 2007;143:631-3. Causeret AS, Skowron F, Viallard AM, Balme B, Thomas L. Subungual blue nevus. J Am Acad Dermatol 2003;49:310-2. Hirata SH, Yamada S, Almeida FA, Enokihara MY, Rosa IP, Enokihara MM, et al. Dermoscopic examination of the nail bed and matrix. Int J Dermatol 2006;45:28-30. Imakado S, Sato H, Hamada K. Two cases of subungual melanoma in situ. J Dermatol 2008;35:754-8. Iorizzo M, Tosti A, Di Chiacchio N, Hirata SH, Misciali C, Michalany N, et al. Nail melanoma in children: Differential diagnosis and management. Dermatol Surg 2008;34:974-8. Braun RP, Baran R, Saurat JH, Thomas L. Surgical Pearl: Dermoscopy of the free edge of the nail to determine the level of nail plate pigmentation and the location of its probable origin in the proximal or distal nail matrix. J Am Acad Dermatol 2006;55:512-3. Bilemjian AP, Piñeiro-Maceira J, Barcaui CB, Pereira FB. Melanonychia: The importance of dermatoscopic examination and of nail matrix/bed observation. An Bras Dermatol 2009;84:185-9. Baran R, Hay RJ, Tosti A, Haneke E. A new classification of onychomycosis. Br J Dermatol 1998;139:567-71. Piraccini BM, Balestri R, Starace M, Rech G. Nail digital dermoscopy (onychoscopy) in the diagnosis of onychomycosis. J Eur Acad Dermatol Venereol 2013;27:509-13. Jesús-Silva MA, Fernández-Martínez R, Roldán-Marín R, Arenas R. Dermoscopic patterns in patients with a clinical diagnosis of onychomycosis-results of a prospective study including data of potassium hydroxide (KOH) and culture examination. Dermatol Pract Concept 2015;5:39-44. De Crignis G, Valgas N, Rezende P, Leverone A, Nakamura R. Dermatoscopy of onychomycosis. Int J Dermatol 2014;53:e97-9. Kilinc Karaarslan I, Acar A, Aytimur D, Akalin T, Ozdemir F. Dermoscopic features in fungal melanonychia. Clin Exp Dermatol 2015;40:271-8. Yadav TA, Khopkar US. White streaks: Dermoscopic sign of distal lateral subungual onychomycosis. Indian J Dermatol 2016;61:123. Jesus-Silva MA, Roldan-Marin R, Asz-Sigall D, Arenas R. Dermoscopy. In: Tosti A, Vlahovic T, Arenas R. (eds) Onychomycosis. Springer; 2017 p. 131-40. Bet DL, Reis AL, Di Chiacchio N, Belda Junior W. Dermoscopy and onychomycosis: Guided nail abrasion for mycological samples. An Bras Dermatol 2015;90:904-6. Tosti A, Piraccini BM, de Farias DC. Dealing with melanonychia. Semin Cutan Med Surg 2009;28:49-54. Farias DC, Tosti A, Chiacchio ND, Hirata SH. Dermoscopy in nail psoriasis. An Bras Dermatol 2010;85:101-3. Yadav TA, Khopkar US. Dermoscopy to Detect Signs of Subclinical Nail Involvement in Chronic Plaque Psoriasis: A Study of 68 Patients. Indian J Dermatol 2015;60:272-5. Yorulmaz A, Artuz F. A study of dermoscopic features of nail psoriasis. Postepy Dermatol Alergol 2017;34:28-35. Ohtsuka T, Yamakage A, Miyachi Y. Statistical definition of nailfold capillary pattern in patients with psoriasis. Int J Dermatol 1994;33:779-82. Zaric D, Clemmensen OJ, Worm AM, Stahl D. Capillary microscopy of the nail fold in patients with psoriasis and psoriatic arthritis. Dermatologica 1982;164:10-4. Bhushan M, Moore T, Herrick AL, Griffiths CE. 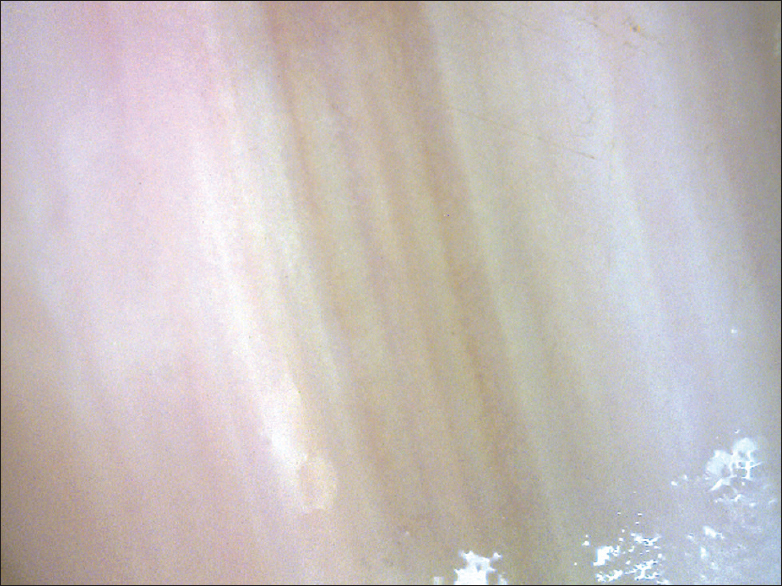 Nailfold video capillaroscopy in psoriasis. Br J Dermatol 2000;142:1171-6. Ribeiro CF, Siqueira EB, Holler AP, Fabr Hol L, Skare TL. Periungual capillaroscopy in psoriasis. An Bras Dermatol 2012;87:550-3. 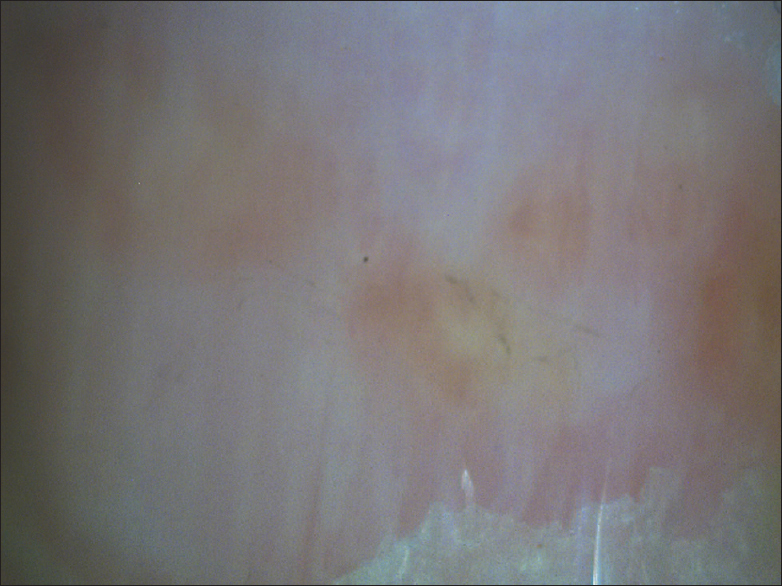 Iorizzo M, Dahdah M, Vincenzi C, Tosti A. Videodermoscopy of the hyponychium in nail bed psoriasis. J Am Acad Dermatol 2008;58:714-5. Elfar NN, Abdel-Latif AM, Labeh EA. Role of onychoscopy in differentiation between distal subungual onychomycosis, psoriasis, and traumatic onycholysis. J Egypt Womens Dermatol Soc 2015;12:145-9. Nakamura R, Broce AA, Palencia DP, Ortiz NI, Leverone A. Dermatoscopy of nail lichen planus. Int J Dermatol 2013;52:684-7. Friedman P, Sabban EC, Marcucci C, Peralta R, Cabo H. Dermoscopic findings in different clinical variants of lichen planus. Is dermoscopy useful? Dermatol Pract Concept 2015;5:51-5. Lesort C, Debarbieux S, Duru G, Dalle S, Poulhalon N, Thomas L. Dermoscopic features of onychomatricoma: A study of 34 cases. Dermatology 2015;231:177-83. Jellinek NJ. Longitudinal erythronychia: Suggestions for evaluation and management. J Am Acad Dermatol 2011;64:167.e1-11. Tosti A, Schneider SL, Ramirez-Quizon MN, Zaiac M, Miteva M. Clinical, dermoscopic, and pathologic features of onychopapilloma: A review of 47 cases. J Am Acad Dermatol 2016;74:521-6. Maehara Lde S, Ohe EM, Enokihara MY, Michalany NS, Yamada S, Hirata SH. Diagnosis of glomus tumor by nail bed and matrix dermoscopy. An Bras Dermatol 2010;85:236-8. Rai AK. Role of intraoperative dermoscopy in excision of nail unit glomus tumor. Indian Dermatol Online J 2016;7:448-450. Duarte AF, Correia O, Barreiros H, Haneke E. Giant subungual glomus tumor: Clinical, dermoscopy, imagiologic and surgery details. Dermatol Online J 2016;22. pii: 13030/qt66f7b8wt. Mutsaers ER, Genders R, van Es N, Kukutsch N. Dermoscopy of glomus tumor: More white than pink. J Am Acad Dermatol 2016;75:e17-8. Thatte SS, Chikhalkar SB, Khopkar US. “Pink glow”: A new sign for the diagnosis of glomus tumor on ultraviolet light dermoscopy. Indian Dermatol Online J 2015;6 Suppl 1:S21-3. Salerni G, Alonso C. Images in clinical medicine. Digital mucous cyst. N Engl J Med 2012;366:1335. Salerni G, González R, Alonso C. Dermatoscopic pattern of digital mucous cyst: Report of three cases. Dermatology Practical and Conceptual 2014;4:65-7. Yorulmaz A, Yalcin B. A Painful periungual red spot in a patient with onychodystrophy. Skin Appendage Disord 2017;3:67-69. Piraccini BM, Bruni F, Starace M. Dermoscopy of non-skin cancer nail disorders. Dermatol Ther 2012;25:594-602. Giacomel J, Lallas A, Zalaudek I, Argenziano G. Periungual Bowen disease mimicking chronic paronychia and diagnosed by dermoscopy. J Am Acad Dermatol 2014;71:e65-7. Nakayama C, Hata H, Homma E, Fujita Y, Shimizu H. Dermoscopy of periungual pigmented Bowen's disease: Its usefulness in differentiation from malignant melanoma. J Eur Acad Dermatol Venereol 2016;30:552-4. Baran R, Kechijian P. Hutchinson's sign: A reappraisal. J Am Acad Dermatol 1996;34:87-90. Hayashi K, Matori S, Kariya Y, Sonosaki T, Yamaguchi S, Hagiwara K, et al. Dermoscopic observation of acquired digital fibrokeratoma developed on the dorsum of the fourth left toe. J Dermatol 2016;43:107-8. 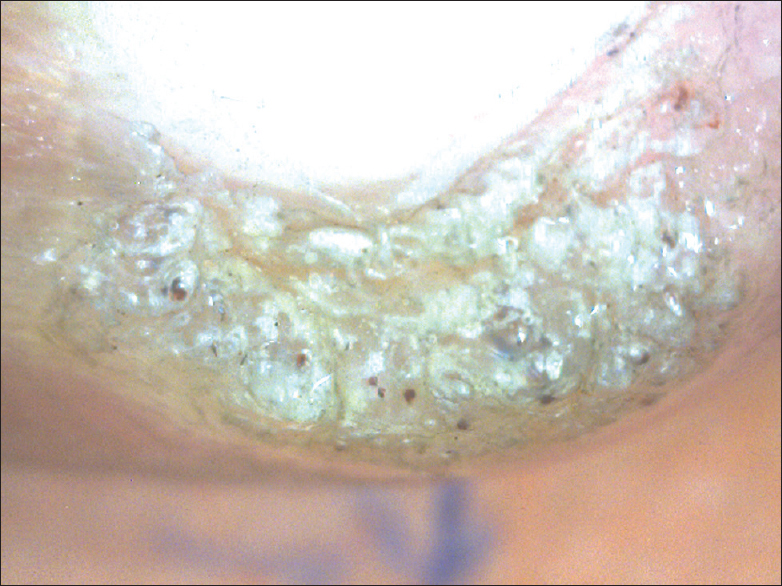 Bel B, Jeudy G, Vabres P. Dermoscopy of longitudinal leukonychia in Hailey-Hailey disease. Arch Dermatol 2010;146:1204.